I grew up loving cars from as early as I can remember, even my wallpaper in my childhood bedroom was race-car themed. From an young age I religiously read a magazine called “Street Machine” which featured mainly Australian domestic muscle cars & hot rods. 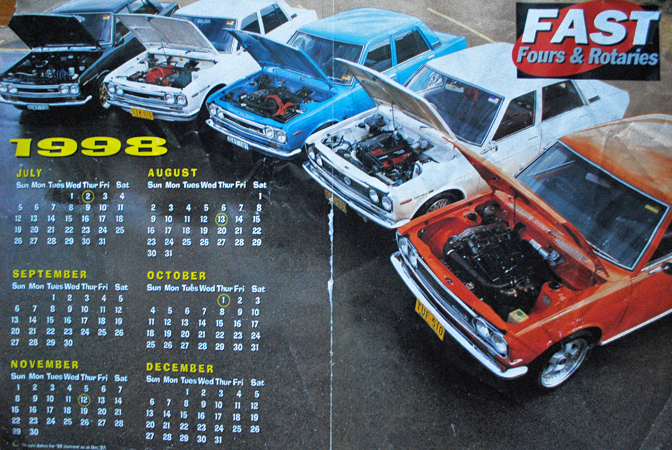 Back in 1997 at the age of 12, a neighbour of mine handed me down a few of his “Fast Fours & Rotaries” magazines. 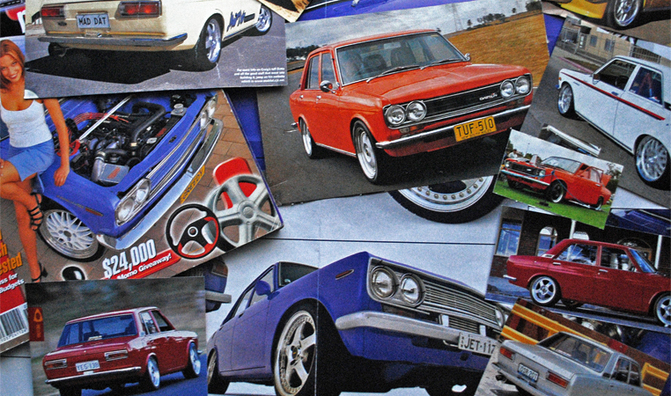 I hadn’t paid much attention to smaller cars until then, when one particular issue caught my attention – the “Datsun 1600 Shootout” issue. 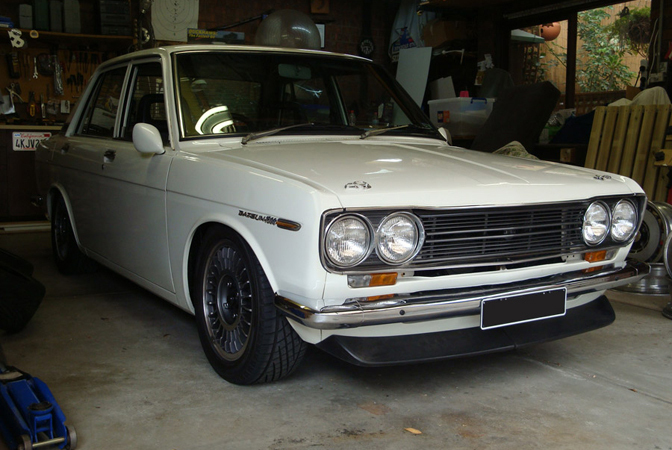 It featured a handful of Datsun 1600s with varying engine transplants and pitted them against each other to find out which reined supreme. 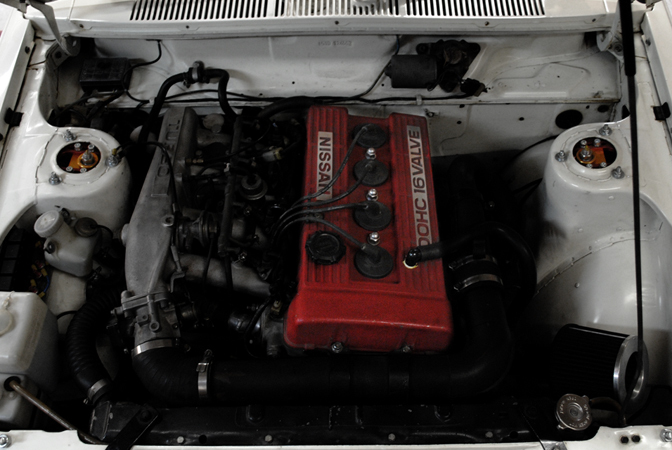 To give you an idea of how far developed the scene was back then, one of the first SR20DET equipped Datto wasn’t quite finished in time for the shoot. 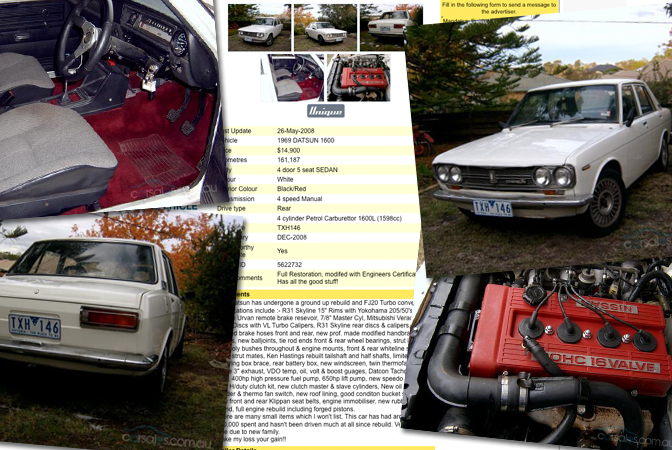 Compare that to nowadays where most Datsun builds are expected to start with an SR transplant. 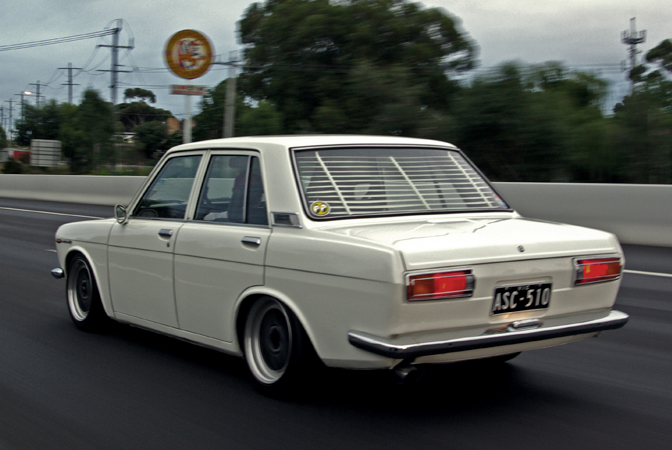 So from that point on, my enthusiasm for Datsun 1600’s became an obsession. Every magazine with a Datto in it had to be purchased, and every time a pencil hit paper it was to draw a car which I learnt to memorise. 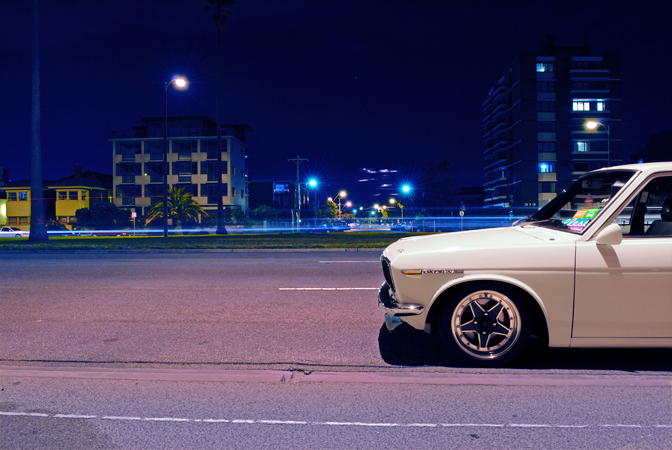 Once I got a bit older and approached the age where I was eligible for a learners permit, I started to pester my dad to let me get a Datsun as my first car. We looked at a few but they were mainly rust-buckets, so we forgot about it for a while. 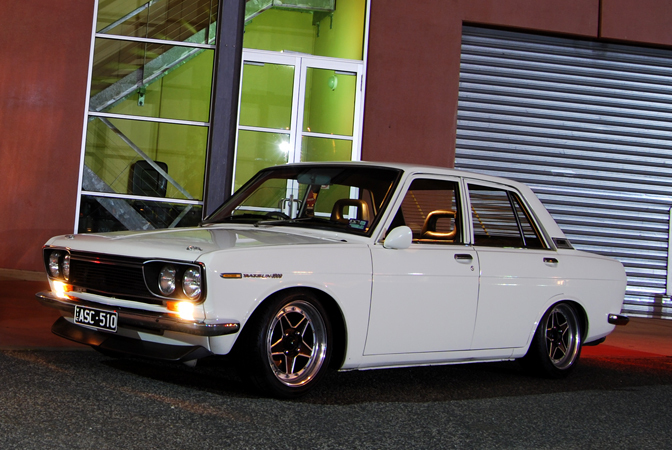 I ended up becoming interested in more modern cars after learning to drive in my sisters SR20DE Nissan Pulsar and obtained one of my own as my first car, but the passion for Datsuns never left my bloodstream. 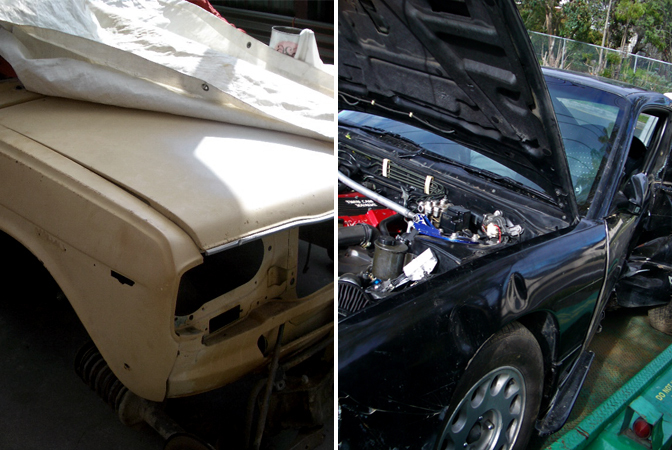 The shell you see above was bought a year or so after I sold that first car, and a wrecked CA18DET 180SX was also purchased and stripped for it’s engine & gearbox. Sadly the project was put in the ‘too hard basket’ after sitting around for about a year and the shell was sold off. On the bright side, the large boxes full of parts that came with the shell were retained, which would come in handy in the future because I was certain I would own another one. Fast-forward a few years (and cars) later, and I was becoming tired of my daily-driven S15 200SX (as stupid as that sentence sounds in hindsight). One day while browsing the online classifieds, the above ad smacked me in the face. Before you knew it, the obsession kicked in and within 2 weeks my S15 was returned to standard, sold off, and the above Datsun + a daily driver were bought with the money. Finally I had one, and it came with an FJ20ET engine transplant already completed. It also had an R180 LSD diff, 5spd gearbox, upgraded suspension, fresh paint and disc brakes at all four corners amongst many other mods included in the previous owners full rebuild. Yeah, yeah, “you took the easy way out” I hear you say. Well, think what you want, but it made sense to me. I saved a lot of money by buying a complete and engineer-approved car, it was ready to drive and enjoy straight away, and I could jump into the ‘fun’ mods instead of taking years to scratch-build one (especially after my first failed attempt). Now that I had one, I could start doing all the mods I had dreamed of for what felt like an eternity. One of the first additions I made was a rear venetian blind, something I saw as essential. 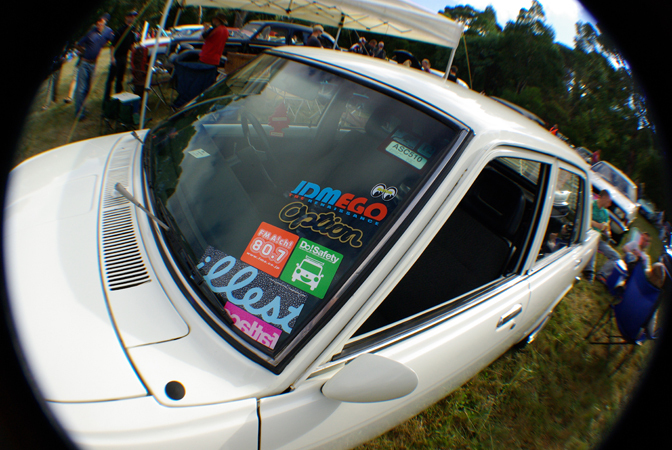 These are a popular mod in Australia on oldschool cars, but I’ve noticed they don’t have the same following around the rest of the world. 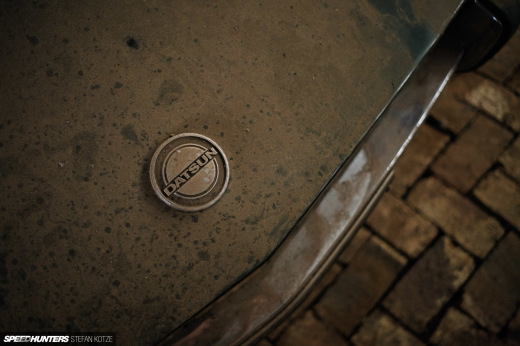 To me, it cemented the fact that I was driving a car made in a bygone era. 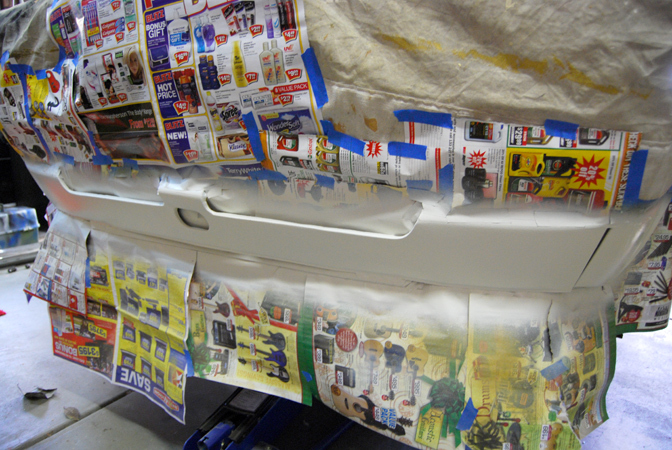 I also spent a lot of time on small detail mods, like cleaning, polishing, and painting various parts to slightly enhance the overall finish of the car. I love getting in the garage and attacking DIY jobs, especially after spending a stressful week at the office in front of a computer. The lower front apron had seen better days and was very dull and stained. I tried my hand at a bit of priming and painting to spruce it up. I can’t believe I just said “spruce”. 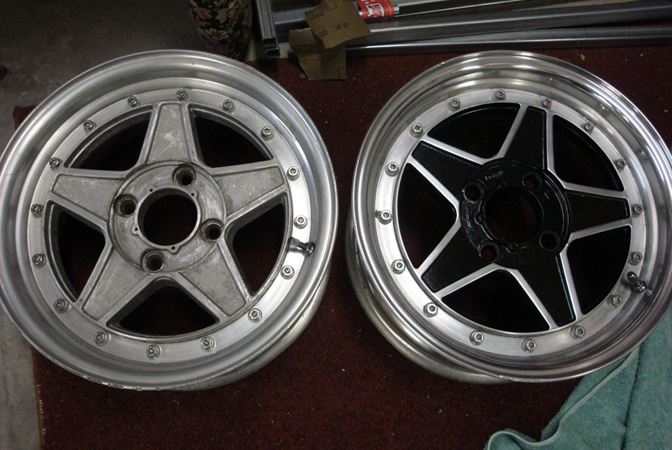 The R31 Skyline wheels that came with the car also received some TLC. I polished all of the spokes by hand (worst. job. ever!) and painted the recessed areas a graphite grey colour. 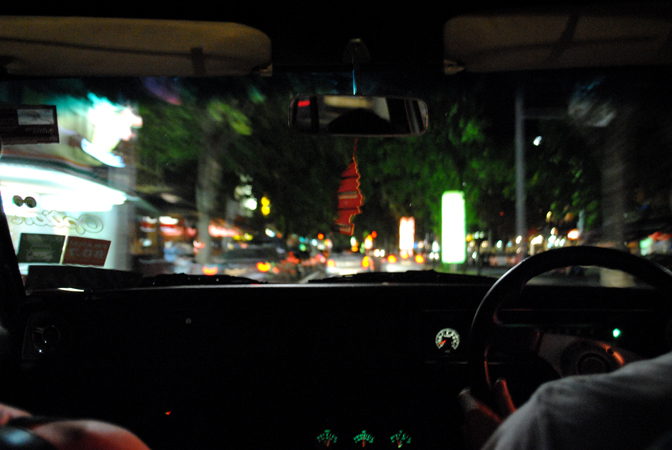 Around the same time, the ugly flappy plastic mirrors were replaced with some reproduction “teardrop” mirrors that used to feature on the iconic Ford GT Falcon’s from the 70’s. 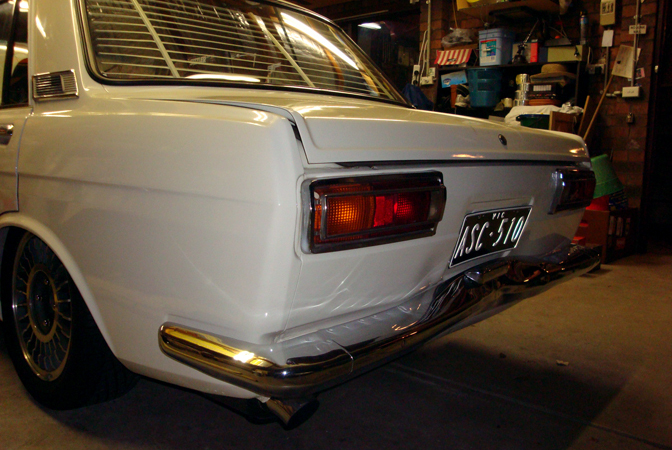 Again, these are a popular modification for older cars in Australia, and I painted them using paint left over from the front apron. Maybe down the track I’ll add some JDM fender mirrors, but I’m not really trying to make this a full JDM textbook ride as I like to take inspiration from various genres of the car scene. 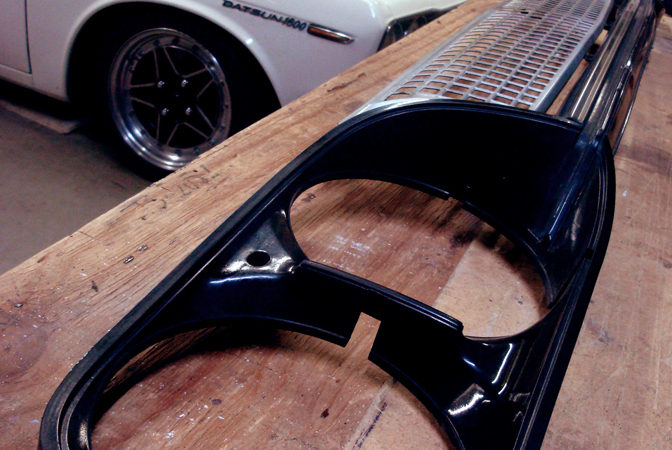 To really spruce…uh I mean jazz up an old car, nothing beats some fresh chrome bumpers. I located a front bumper in much better condition than the one that came with the car. For the rear I found a dull but extremely straight item and layed down the cash to get it re-chromed. It was worlds apart from the original rear bumper which looked like it had been through the wars, complete with nasty gouges. Nothing like seeing some fresh chrome to offset the pain of actually paying for it. This is how the car was looking at around that time. Subtly improved, yet noticeably cleaner looking compared to when I bought it. I had also fitted some black & white personalised license plates, painted/polished the grille and headlight surrounds, and compressed the springs. I felt like once I attached the plates, it really became “my” car. In case you’re wondering, ASC is my initials, and 510 of course is the model of the car. Another modification I felt necessary to make the car “my own” was to fit some different wheels, as I’ve done with all my previous rides. I was hell-bent on buying a set of 17″ FR Simmons, Australian made 3-piece wheels that are very popular both here and in New Zealand. 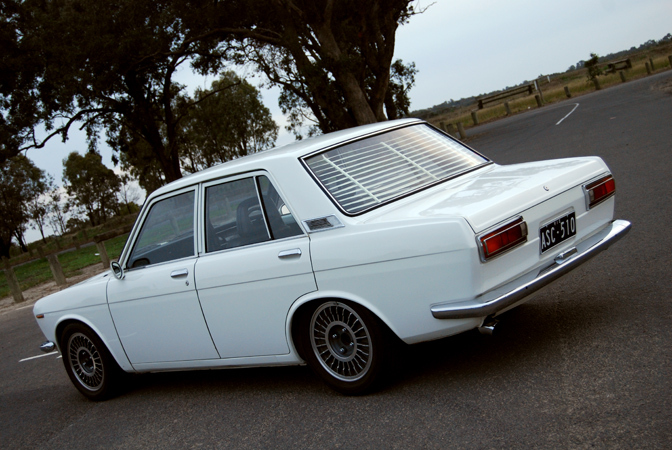 The ‘big wheel’ look is something most people my age grew up with, as all the best Datsuns and oldschool Mazda rotaries were rocking Simmons back when we were reading our favourite car magazines in highschool. The only problem was the price, at over $2.7k for a set I knew I could spend the money better on other mods. 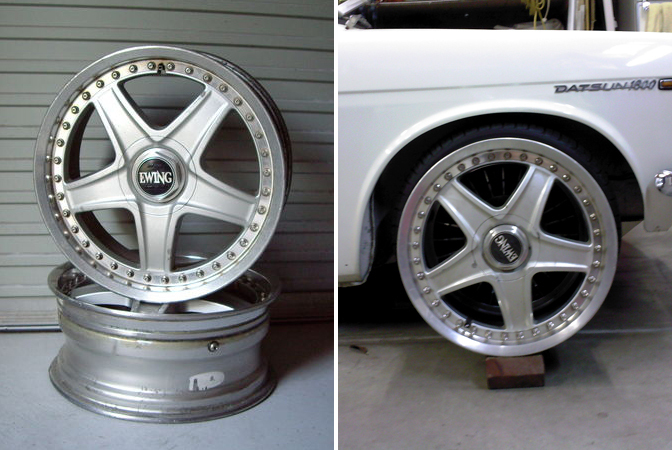 One day on my usual ‘net browsing, I managed to stumble across a pair of Work Ewing 17x7s for a cheap price, so I decided to snap them up. To me it was like a middle-ground between the look I had always known, and the JDM look that I had slowly been taking over my interests since joining JDM StyleTuning. While I searched for a second pair, the wheels were put away so I could concentrate on something else that I considered very important, the ride height. It had been bugging me since I bought it and it had to be reduced dramatically otherwise I’d never be happy. As mentioned previously I had originally compressed the already lowered springs that came with the car, but the results didn’t impress me so I knew I had to bite the bullet and fit something with some adjustability. For the rear I chose Troy Ermish Racing coilovers for the ride height reduction, and a Datsport DIY adjustable rear crossmember kit to combat the alignment issues that arise with 40+ year old independent rear suspension. 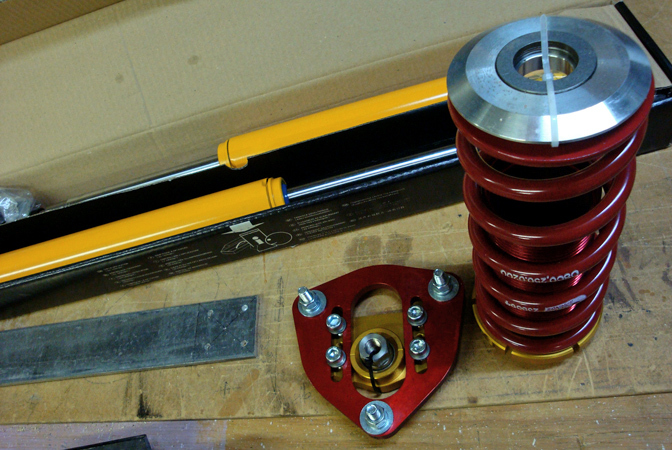 On to the front, I chose Z31 Koni damper adjustable dampers, and attacked the T3 catalogue for their adjustable camber tops and a weld-on coilover kit. I also managed to track down some Nissan America 1″ bump-steer spacers to attach to the bottom of the struts, as I knew my desired ride height was going to push my lower control arms way past horizontal. They were truly a lucky find as they were brand new, OEM quality, and the guy who sold them to me lived a few suburbs away. 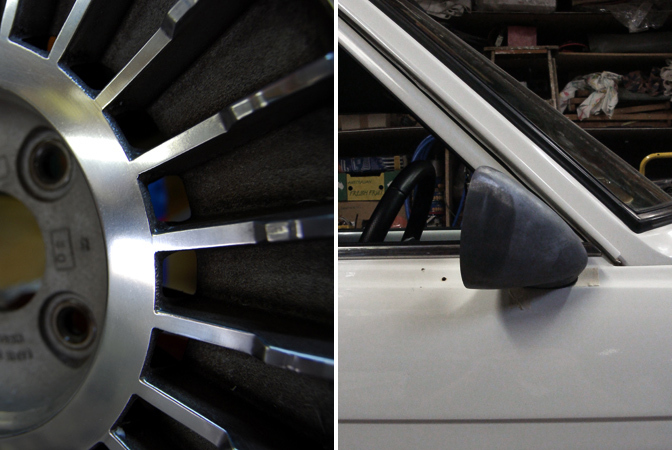 Being a regular reader of Rob’s Racer86 blog, I loved the look of a MK1 Golf front duckbill when fitted to an older JDM ride, just like the one on the first incarnation of his KP30 Starlet. So I set out to find one of my own on a local VW forum with great success. 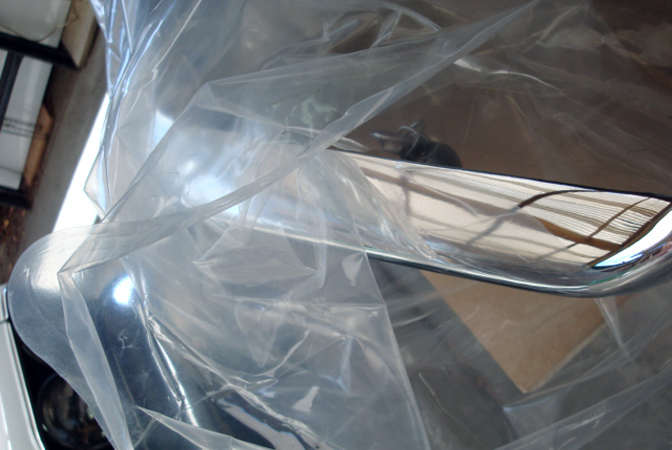 I didn’t enjoy drilling holes into the metal apron (especially after I’d painted it!) but it all came together in the end. So with the ride height wound down, and the front lip attached, the car took on a more aggressive look, and I loved it! The compliments started flying in, and I was finally happy with the cars appearance, especially when viewing it’s reflection in the all important ‘shop window drive-by’. 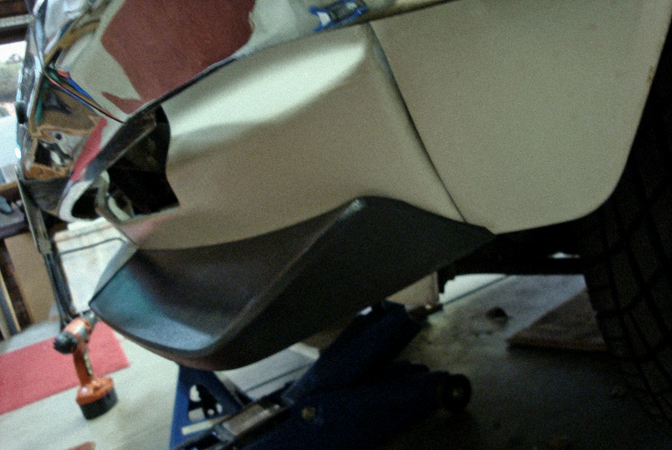 Now that the look was sorted, I could turn my attention to another part of the car that needed some help. The standard engine management was not doing a good job of, well, managing the engine. After talking things through with my workshop of choice, I went for a Microtech LT10s. With the unit fitted and tuned, the car pushed out a respective 155kw at the wheels on a moderate 12psi (non-intercooled). The increase of 30 or so kw at the top end was very welcome, but the 50 or so kw increase in the midrange was even better. The car now started easier, idled lower, ran smoother, and went much harder. The new management also allowed for some items to be removed from the engine bay, such as the airbox and AFM. Some wiring that was previously run along the firewall was re-routed behind the dash. Still a lot more work to be done in this department, but it’s a start. However, my joy was to be short-lived when an unmarked police car put and end to any automotive bliss I was experiencing. Not by pulling me over, but by running into the back a MK4 Passat, who in-turn ran into the back of my car. Even with their insurance taking care of everything, and my car being repaired at a place approved by my specialty insurance, it was still a headache to help source the parts. After months of waiting, it finally returned home better than before. While waiting for the repairs to take place, I thought the car deserved a present for it’s home-coming after this tragic ordeal. 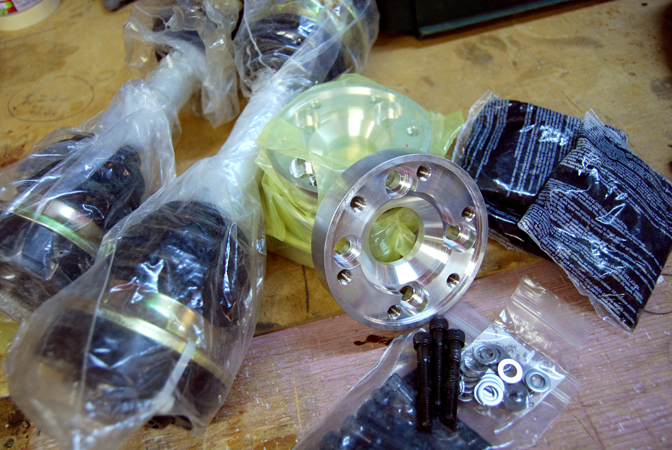 I started pestering fellow local car enthusiast and Yahoo auction expert Dan for ‘shipped to my door’ prices of various wheel packages I was finding on yahoo.jp. 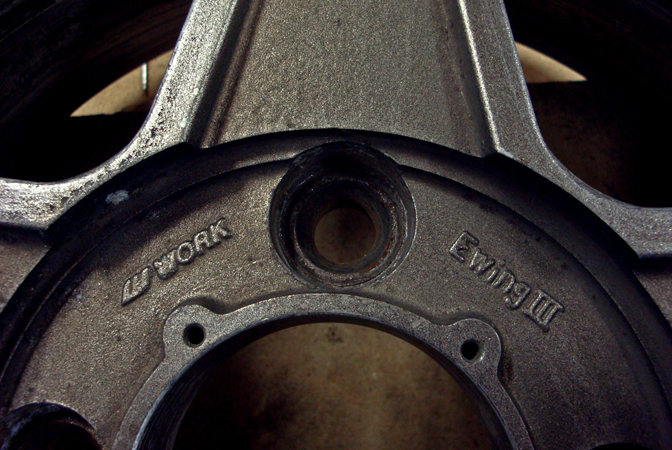 After not bidding enough for some vintage Work Equip 03’s, I found a set of 15″ Work Ewing III’s in perfect sizes for my car. What a strange co-incidence that I would find the same style of wheels as the 17s I had only bought by chance earlier. By this stage I had long given up on the 17s after noticing the increased ground clearance such a big wheel creates, all but eliminating the road-hugging stance I was after, so they were sold off long before the accident (stop cheering!) I ended up winning the auction so maybe it was meant to be? Before the wheels even arrived I already knew how I wanted them to look. I had seen the same wheels on one of the 510’s belonging to Jeff “Icehouse” from Ratsun.net in a colour scheme I was determined to emulate. It took a lot of late nights full of sanding, sanding, more sanding, and a little bit of painting but the end result was worth it. I had another lucky online find while I was re-furbing the wheels in the form of a JDM 1973 model grille and headlight surrounds. 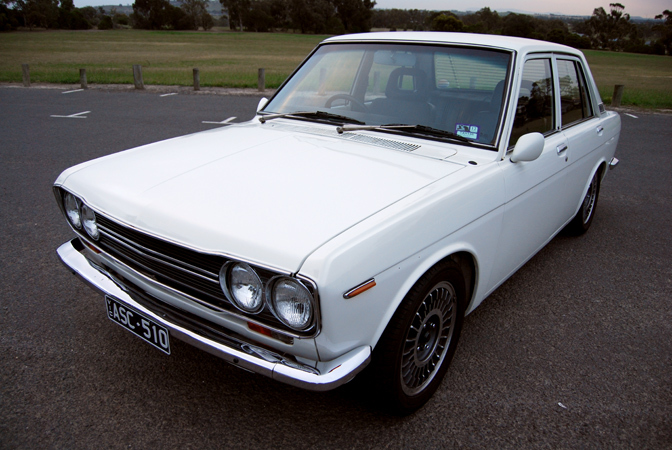 We never got the ’73 model 510 in Australia so they’re pretty rare over here. I didn’t really like these grilles when I first saw them in a car magazine years ago, truth be told I thought they were straight ugly but as I got older the look of them grew on me, to the point where I knew I had to have one. I was certain it would work perfectly with the style I was going for, and that it would complement the plastic front lip I had fitted. With the wheels painted, some 195/45s wrapped around them, and the new grille attached, the car changed it’s image again. I like to think of this as it’s second wind. I borrowed the Nikon D40X from work and went out for a little photoshoot. I’m no photographer but I think this set came out pretty nice. 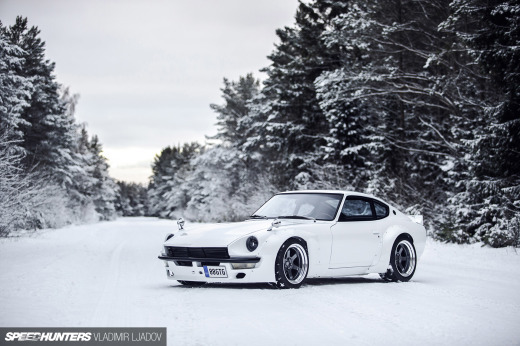 Seeing the car squatting over some lightly dished JDM rims, the low profile tyres, and that mean front end, I had a fresh love for the appearance of the car. It was as if I finally had in my garage something that I had only ever previously seen on the internet. This is when the car started to get noticed more online, even appearing on i put in WORK. With the low ride height came a new problem. 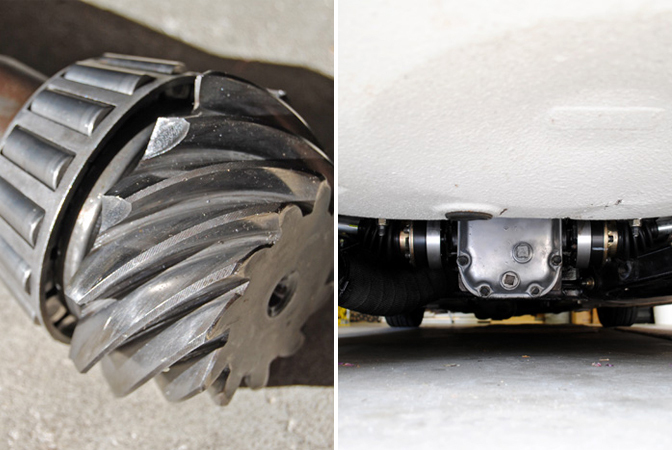 I could handle the scraping over speedbumps, entering driveways at an angle, and avoiding some locations all together, but the vibration coming from the uni-style driveshafts was getting annoying. I couldn’t take the car above 70kmh without everything shaking, so something had to be done. 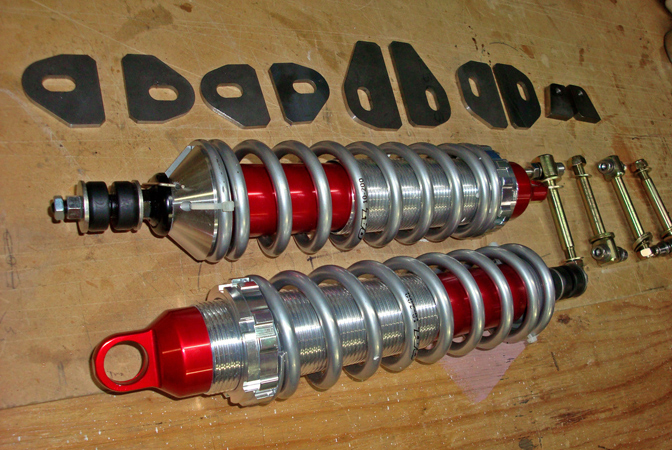 I contacted Todd from Wolf Creek Racing and ordered a set of his CV conversion driveshafts. With these fitted, the vibrations were gone, and I could take comfort in knowing the new race-developed driveshafts could take any punishment I throw at them. Sadly, after driving the car once, the diff started to let go. I was lucky that my LSD was alright, and it was only the crown wheel & pinion causing the issue. The diff came out and I did the usual Googling and calling around that you have to do when searching for parts for an older car. I ended up at The Z Shop, a local Z-car specialist, and I was able to meet a really cool guy by the name of Lindsay who helped me sort through his huge collection of spare parts until I found what I needed. That’s one of the best parts about working on old cars, the interesting people you get to meet and the stories they tell you. With the diff rebuilt and reinstalled the rear end was looking and performing better than ever, and I was able to use the car for what it does best, driving. Or sitting at an outdoor show with other oldschool rides. I love driving this car, and I don’t get to do it enough. Future plans? Where do I begin? Take the engine out, tuck some wiring, respray the bay+engine, I have some specific ideas in mind for the overall appearance of the under-bonnet area. I have a front-mounted intercooler that I’m yet to fit, which needs an alloy radiator to accompany it, so I can then turn up the boost some more. The interior will be fully re-trimmed in maroon with diamond stitching, including some bucket seats. Wider wheels would be nice, a full respray even. I have an RB20 gearbox to replace the current one when it lets go, where does it end? It will all happen in due time, as this obsession shows no signs of slowing down. Did I mention I would love to own another one with a carb-fed L-series engine, and another one with an SR, and another…. I hope you have enjoyed my journey as much as I enjoyed writing about it and re-living it. 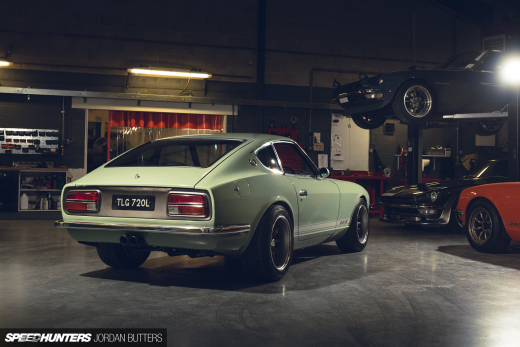 I would once again like to thank Rod for allowing me to guest-blog on Speedhunters this month, and thank you all for taking the time to read my posts. Love it!!! Absolutely love it!!! i actually recognize where some of those pics are taken.. go me! hah. looks great in the pic sitting down at stkilda beach. keep up the good work anyway. tough little car. Wow, just wow. I like how you used many subtle modifications to change the look of the car completely. On the mechanical side of things, I'm more of an oldschool carb guy than a turbo nutter, so I'd prefer a set of Mikuni 44s to a Garret T3, but I admit that turbo power is addictive. BTW, did you think about a front mounted intercooler? It should help keep the temps down a little bit, plus you'd get a substantial power gain without straining the old FJ. fast fours and rotarys are what got me into the japanese scene. 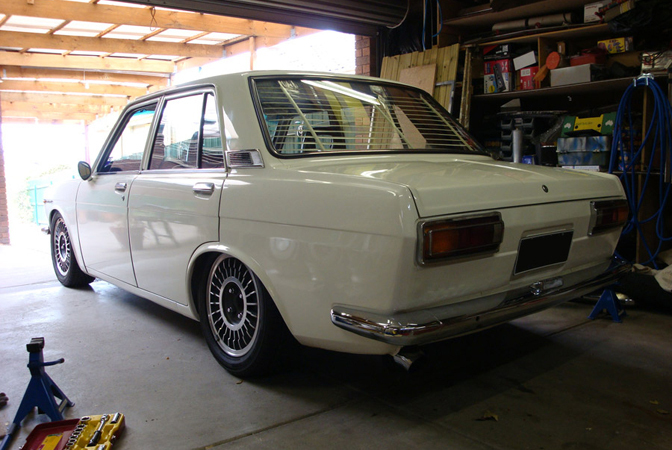 Sweet 510 Anthony, good read too! Awesome write up and an even better car. Congrats. Love the first shot, great car.....tastefully modified. 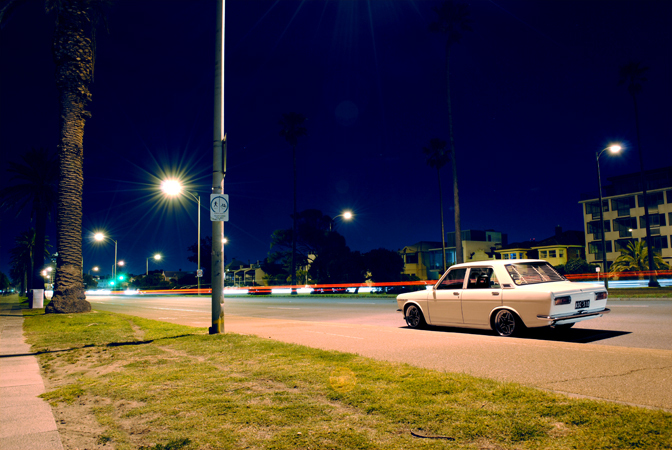 Old school meets new stance, awesome. Love the St. Kilda pic! 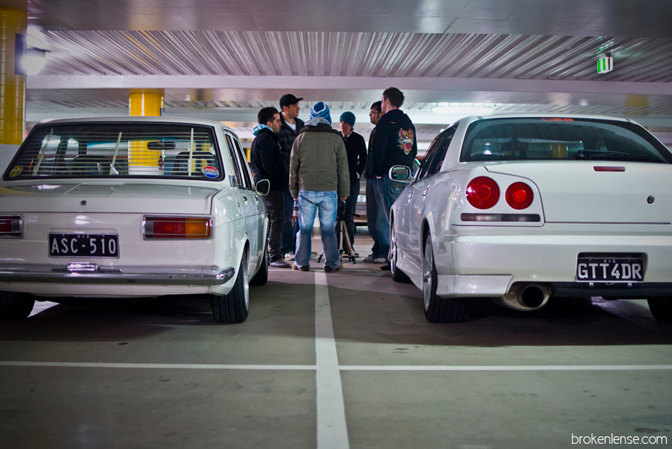 Hey, that's Juliettes R34 GTT 4 door in the last pic, was that from a SAU Meet up? Awesome read Anth, i want your car. Top work. Are you the guy in the hat in the last pic? I've seen this before I think on Japanese Nostalgic Car, tuff ride you have there one of the best 4 doors I have seen. One of my brothers friends also has 510 with an FJ20DET in it and it flys. 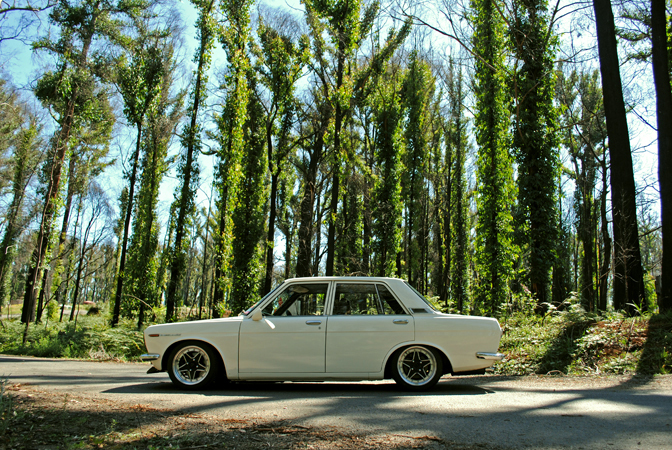 Im not a fan of SR or CA conversions, I think the FJ20 is a better option for a 510. I actually have a FMIC sitting at home, I just have to wait until I get a different radiator + an elec water pump to make it all work. The standard water pump is too large to fit a radiator, thermo fans, plus a FMIC all behind the grille. Sorry, I was a bit vauge in my statements about SR powered 1600's, I'll see if I can get it edited. Yep that's Juliette's R34, the pic was taken at a JDMST meet. Thanks, but you can't have it I am the guy on the very left in that pic. The best ive seen. Honestly, its perfect. Great post! I would say it's perfect and I loved your writing about it. I think everyone can feel, that you're living your dream. Beautiful car and awesome read! 'Nuff said! Must be great owning a car like that! Very very very nice post! Love seeing how much all the small changes add to the character of the car. very nice post, the first one i read! 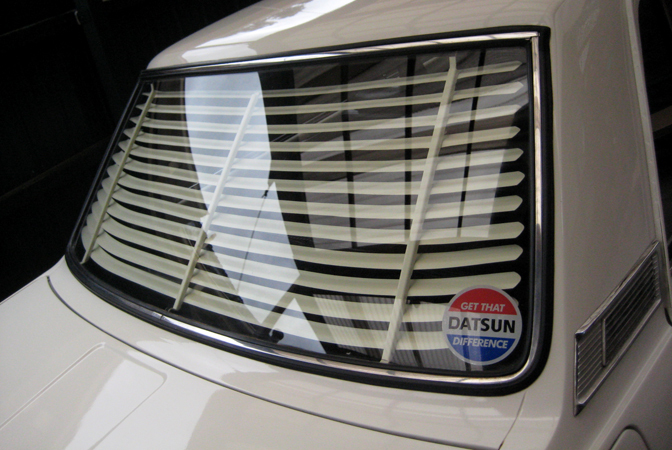 love the datsun! is that monash clayton carpark in the last photo lol? Great write-up Anth, joined Speedhunters just to read. I like that last pic the best, but I might be biased The attention to detail on this car is incredible. regginblack - Docklands, the multi-level carpark closest to the ferris wheel. Perfect! why aren't you work for speedhunters?!?!?! No need to change the story at all, i was just mentioning it in passing. Not to take away from your awesome story and car. Anth, nice write up mate. like the chinese guy TroYaa said " why aren't you work for speedhunters?!?!?!" Very nice work with the Datto, come a long way since its humble begginings... only problem now is when i look at your car and then look back at mine its so high and ugly! Keep inspiring us with these subtle mods n classy touches.. n keep on spruce'n.